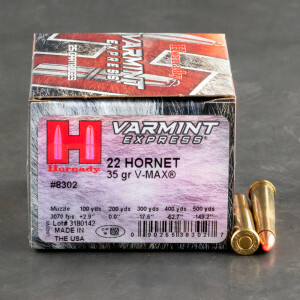 Taking the name of the fierce, stinging, creature, the 22 Hornet is known as being one of the more powerful varmint cartridges. The 22 Hornet is capable of pushing a much heavier bullet at a much faster feet per second rate than the 22 Long Rifle, and even more so than the 22 Magnum. 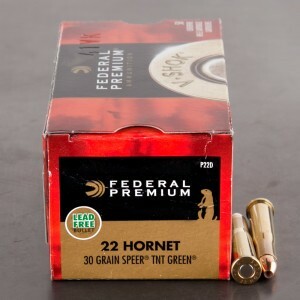 The 22 Hornet uses the more reliable centerfire cartridge design, over than the traditional rimfire 22 caliber rounds. While the round may not be as potent as the 223 Remington, the round is capable of taking varmint with less noise, recoil, and can shorten the weapon’s action. Believe it or not, the 22 Hornet was also a military round for a short period of time, issued as a survival cartridge to be used by pilots. Oddly, 22 Hornet was labeled to “never be used against enemy combatants” due to their expanding nature. I have a Ruger 130 .22 Hornet single shot varmint/target rifle that my father gave me for my 15th birthday. I am now 53, and finding this ammunition is difficult at best in the local shops. This is a re-loadable centerfire .22 round. I love the performance and have never had any troubles. Just glad I found a more reliable source for this type of ammunition.